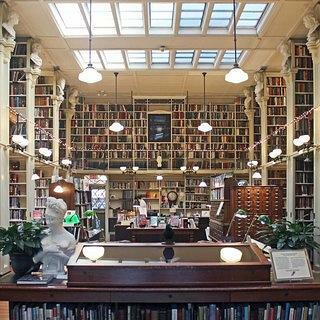 We asked Warburton to give us a sampling of the fascinating refurbished historic spaces around Providence that have found new life because preservation work. Below are several of Warburton’s photos along with her own captions, sharing a little more about these buildings’ past and present. 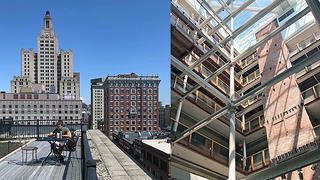 The photo on the left looks out from the rooftop loft of Peerless Lofts, a renovated former department store building. 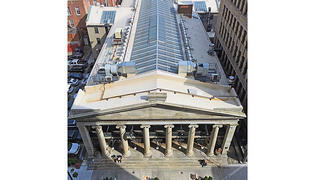 To the right is the Union Trust Building (1901), a former bank converted to a restaurant, and on the left is the Industrial Trust Building (1928), now vacant. The photo on the right shows the atrium of Peerless Lofts. The Providence Arcade (1828) is a National Historic Landmark, significant for being the country’s first enclosed shopping mall. It was fully renovated with the help of historic rehabilitation tax credits and now includes locally-owned shops and dining spaces with microlofts above. 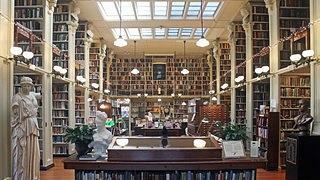 One of Providence’s most storied and photogenic institutions is The Providence Athenaeum (1838) on Benefit Street. 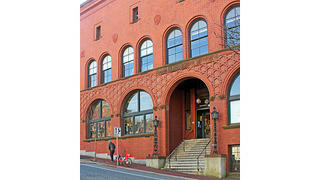 Founded as a private membership library, today the building is open to the public, featuring multiple floors of books and holding regular events. 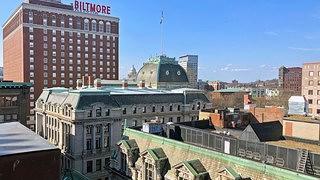 A bird’s eye view of downtown, with the Biltmore Hotel (1920) on the left, Providence City Hall (1874-78) in the center, and the roof of the former Providence Journal Building (1934), which is being converted to a hotel after years of vacancy. 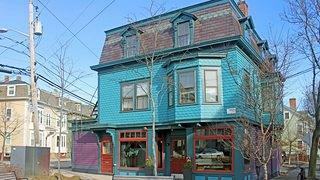 In 2000, the Providence Revolving Fund used historic rehabilitation tax credits to support the renovation of several vacant and dilapidated historic buildings in Luongo Square. The first of these renovations was to this bar and lounge, The Avery. 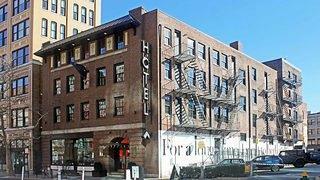 A former Episcopal Diocese mission (1912) with a colorful history (the building was later used a brothel and a gentleman’s club) started a new chapter in 2014 as The Dean Hotel. A historic rehab tax credit project, The Dean is a trendy boutique hotel with a coffee shop, karaoke bar, and restaurant. Rhode Island is known for its textile industry history, and many former mill buildings have been converted to new uses with historic rehabilitation tax credits. 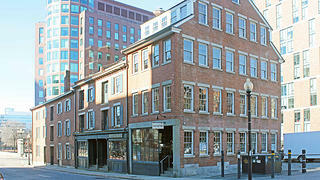 This circa-1847 jewelry manufacturing warehouse is now home to a bistro on the ground level. 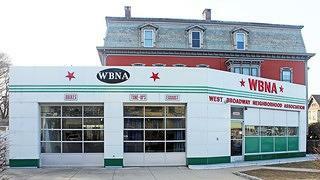 The West Broadway Neighborhood Association advocates for residents and businesses in the city’s West End. Its headquarters occupy a delightfully reused Texaco station, one of few preserved examples of roadside architecture in the state. The east side of Providence serves as an urban campus for several universities, including the prestigious Rhode Island School of Design. The Waterman Building seen here was the school’s original building and is now used as classrooms and studio space. 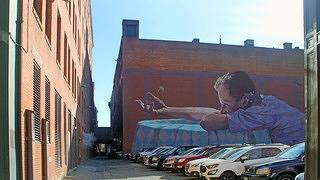 In recent years, Providence has come alive with color thanks to large-scale murals throughout the city. This mural entitled “She Never Came” by BEZT from Etam Cru was commissioned by public art advocate The Avenue Concept in 2015. 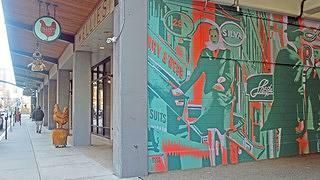 The ground level of the Biltmore Hotel parking garage was creatively converted into restaurant and business space. A lively mural completed by artist Buck Hastings in 2018 includes images of Providence signage and spaces, some of which no longer survive. 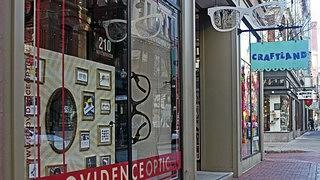 Local shops along Westminster Street in downtown Providence catch the eye of passers-by with quirky signage and creative storefront displays.